what our leadership can do. 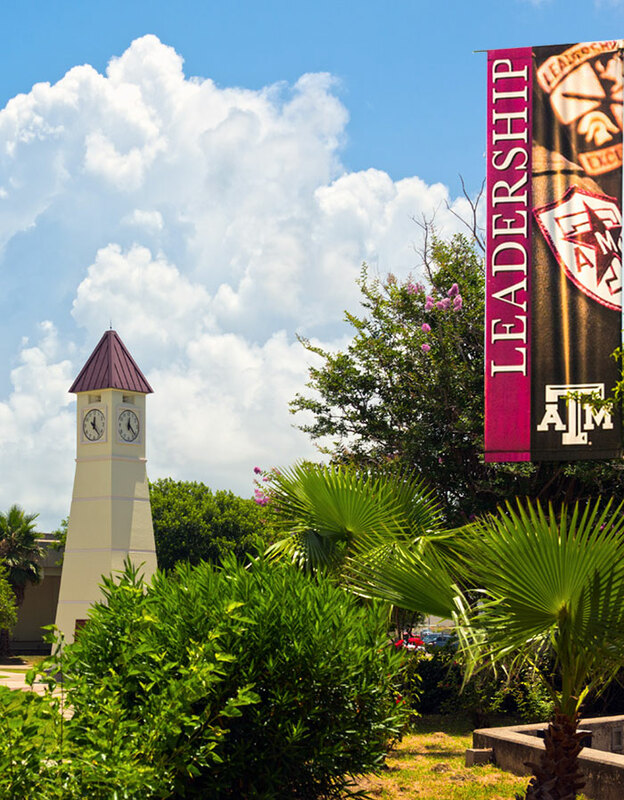 The Texas A&M University Galveston campus's (TAMUG) leadership in administration promotes excellence and integrity in every facet of University life. Excellence at TAMUG means that we provide a first rate education worthy of the A&M diploma and aggie ring, while developing personal qualities of leadership, ethics, integrity, and respect. Excellence also means that we provide a campus environment that is safe, clean, and vibrant – including outstanding student services, housing and food services. We have opened the door to the final phase of Vision 2020: Creating a Culture of Excellence. The Strategic Plan 2016-2020 speaks to the unique nature of our campus. Texas A&M University Galveston campus is committed to accountability in its pursuit of excellence. The university expects to be held to the highest standards in its use of resources and in the quality of the educational experience. All academic units, research, diversity, marketing/communications, and IT report to the Executive Associate Vice President for Academic Affairs and Chief Academic Officer. Five administrative units including student affairs, administration and auxiliary services, marine education support and safety operations, Texas A&M Maritime Academy as well as finance, report to the Vice President. Operations (human resources, campus police, bookstore operations as well as oversight of outsourced dining and facility services) report to the Associate Vice President for Administration and Auxiliary Services. The executive staff are made up of those Texas A&M administrators and faculty who report to the Chief Operations Officer and Vice President. To aid and assist the Chief Operations Officer and Vice President and the Executive Team are a number of councils and committees whose charge or responsibility is to provide advice, feedback and insight on a wide range of issues and topics that affect the campus community. With a goal of helping our students graduate faster and with lower debt, TAMUG is committed to providing a modern and efficient student learning experience founded on academic excellence. We pledge to uphold the Aggie tradition and standards and contribute to a dynamic student learning community. The mission of the Texas A&M Maritime Academy is to provide the maritime industries of the State of Texas and the United States with highly trained and professional U.S. Coast Guard licensed Merchant Officers (deck/engine) to serve on ocean-going and inland waterways vessels. To meet this mission, the Texas A&M Maritime Academy includes a Corps of Cadets. The purpose of the Corps of Cadets is: To develop leaders of character dedicated to serving the greater good. Partnered with the Office of the Commandant of the Corps of Cadets is the Navy ROTC program, which provides the opportunity for qualified Cadets to commission and serve in the Strategic Sealift Officers (SSO) program. Cadets also have the option to request active duty in the U.S. Navy, U.S. Marine Corps (Platoon Leaders Course – PLC) or a direct commission in the U.S. Coast Guard. The Maroon Delegates of Texas A&M University at Galveston was formed out of the need to have exemplary students serve as ambassadors for the university. The students bring a unique perspective that is real and authentic due to their direct proximity to the drive of the university – education. The Delegates take a position of service, selflessness, and respect while they daily embody the Aggie core values. The Maroon Delegates are a highly involved group of individuals exhibiting leadership in various forms. The Delegates truly cherish the experiences they encounter at their piece of Aggieland by the Sea and welcome any opportunity to express devotion to the maritime field.